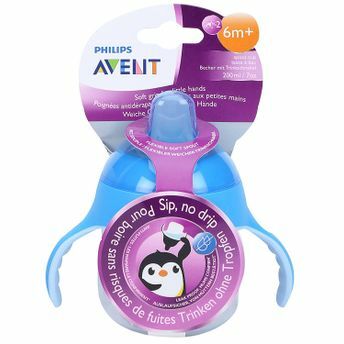 The Philips AVENT new BPA free sippy cup features a patent pending valve that guarantees no spill. The soft spout and handles ensures easy drinking for your toddler. Easy for your child, convenient for you. The angled spout is designed to help toddlers take their first sips easily without tilting their head back too much. This Philips Avent cup is made from BPA free material. Trainer handles help your toddler to hold the cup and drink independently. These handles are not only shaped for little hands to grap easily, they are also rubberized for a non-slip grip. The new Philips Avent cup is compatible with the Philips Avent Natural and Classic+ bottle range, excluding the glass bottle and all other Philips Avent cup excluding the Natural Drinking Cup. Whether at home or on-the-go, the protective hygiene cap always keeps the spout clean. No more mess! The new patent pending valve ensures that water comes out only when the child is drinking from the spout.